A Place for Craft was the theme for 2015’s conference which was held on Saturday 9th May at the V&A Museum. The conference highlighted the relationship between crafts and location – focusing on those crafts which have developed in particular regions or locations, and why craftspeople have chosen to live and work in areas with a special tie to their craft. Speakers included Sir Christopher Frayling and Genevieve Sioka, artisan buyer for the National Trust, and makers and craftspeople were able to bring and exhibit the tools of their trade at the conference. Sir Christopher Frayling has a deep interest in art, design and craft, and has written extensively on the subjects, including his book On Craftsmanship. He was Chairman of Arts Council England 2005­–2009 and has also been Chairman of the Design Council, Chairman of the Royal Mint Advisory Committee, and a Trustee of the Victoria & Albert Museum. He was a governor of the British Film Institute in the 1980s. Christopher Frayling was awarded a knighthood for Services to Art and Design Education in 2001. He has written and presented television series such as The Art of Persuasion on advertising, and Strange Landscape on the Middle Ages. Genevieve is Artisan & Craft buyer for the National Trust, last year launching their Artisan & Craft collection featuring the work of Sasha Wardell, Sue Binns, Scott Benefield and Wallace Sewell to name but a few. Tasked with sourcing products with provenance, authenticity and spirit of place, Genevieve works closely with established and emerging makers alike to develop pieces for the National Trust shops, forging sustainable and profitable relationships for both parties in order to continue to support the National Trust in looking after special places for ever and for everyone. With a background in lecturing Textiles and Printmaking and with a Masters in Multi-Disciplinary Printmaking, Genevieve now thoroughly enjoys being able to bring great British craftsmanship to the National Trust audience, encouraging shopping for a cause whilst telling the stories of great makers. Her passion for all things rush led her to start designing and making. She and her team now cut 4-5 tons of rush a day during the summer harvest. They hand weave a range of work: rush floor matting, tableware, log baskets, handbags, cushions, hats and shoes. Their work can be seen in National Trust properties in the UK, the Chateau Azay le Rideau in France, The Metropolitan Museum of Art in NY and they work with many designers, architects and shops here in the UK and overseas. She also teaches her craft here and in Europe. Felicity was made a Yeoman of The Worshipful Company of Basketmakers in 2009 and in 2011 Rush Matters was awarded the CPRE Mark in the Living Countryside Awards. Richard Eaton, who was born and brought up in London, initially came to Denby Pottery in rural Derbyshire as an enthusiastic young student on work experience for his Master of Arts degree. Richard instantly felt an affinity with Denby’s stoneware clay, designing and putting into full production a unique, and now collectable, range of giftware. Richard returned to Denby in August 1987 after completing his M.A. in Ceramics and a B.A. in 3 dimensional design. Within a short time Richard was promoted to Head of Design and subsequently Design Director. Over successive years Richard has built up the Denby Design Team which comprises six designers and five technicians. In addition to his work for Denby, Richard encourages the work of young new designers. He has been a member of the panel of Judges for the Royal Society of Arts design competitions and an advisor on the Princes Youth Business Trust. Richard was until recently an external assessor for M.A. in Ceramic Design at Staffordshire University and is currently undertaking special projects with a number of Universities. Over one, under two – Straw plaiting for the hat industry was an occupation for tens of thousands of men, women and children throughout the United Kingdom in 1800s but with the introduction of imported straw plait from the Far East in the 1870s the skills began to die. By the 1930s the number of plaiters in the country could be counted on one hand. Veronica’s presentation will tell her personal journey to rediscover these skills. Her journey, started in the 1970s has taken her around the world and leads her to become a museum curator looking after the nationally important Hat Industry and Headwear collection at Wardown Park Museum, Luton. We had a marvellous programme focusing on craft tools. 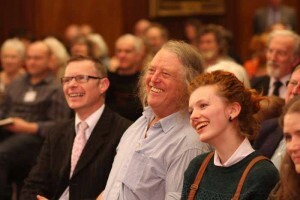 In the morning Professor Trevor Marchand spoke, amongst other things, about the ways in which a maker uses tools, and he was followed by Dr Phil Harding of Channel 4’s Time Team who is a renowned flint knapper and made the tools for the new Stonehenge Exhibition. In the afternoon there were three craftspeople at the top of their game which will be explaining about the tools they use: Roger Smith, who makes hand-made watches, Daniel Harris who established London Cloth using British wool, and Grace Horne who not only makes knives but also corsets. There was also an Instant Gallery featuring makers’ favourite tools, with an explanation of how they are used. Then we had the very first Heritage Craft Awards presentations, where those who were recognised as the very best in their field were announced and presented with certificates and cheques. The morning (Making Matters) was spent with key speakers talking about how important craft and making is. The keynote speaker was John Hayes Minister without Portfolio. He replaced Skills and Enterprise Minister Matt Hancock who has had to pull out of the event. Lord Cormack, former Chair of the All Party Arts and Heritage Group and HCA Patron, also gave a short talk about the significance of making. 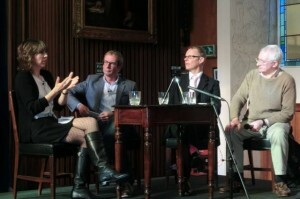 This was followed by The Future of Craft – views of Craft Visionaries, chaired by Guy Salter. Where is craft going? What is hot? How should we be pitching our work to target the changing market. In the afternoon (Marketing Makers) we had more great speakers giving targeted advice for your business to help you increase sales and profit whilst doing what you love. The event also included the launch of new materials for teachers, developed in association with Farming and Countryside Education (FACE), with the support of the Ernest Cook Trust. Guy Salter is Founder and Chair of Crafted, the outstanding mentoring scheme for craftspeople, as well as Deputy Chair of Walpole, the luxury group. Whilst working for The Prince of Wales he also founded and developed Duchy Originals and is on the Council of The Prince’s Trust. Ewan Clayton has just published his latest book, The Golden Thread – The Story of Writing – which has had wonderful reviews (Telegraph, Financial Times, BBC Radio 4 ‘Midweek’). He is Professor of Design at Sunderland University and is co-founder of the International Calligraphy Symposium and the Foundation Degree in Calligraphy at Kensington Palace. Tanya Harrod was awarded the James Tait Black Award in Edinburgh this year for her seminal work on the British potter, Michael Cardew, and was the author of the prize-winning The Crafts in Britain in the Twentieth Century. Tanya was previously a Trustee of the HCA and is now an advisor. Mark Jones was formerly the Director at the Victoria and Albert Museum, and is now Master of Saint Cross College in Oxford. Mark was instrumental in the Heritage Crafts Association having its launch at the V&A, and he continues as one of the HCA Patrons. Vanessa Swann was awarded the Art and Business Garrett Award in 2011 for encouraging business support for the arts, and is CEO at Cockpit Arts and has changed it from a managed workspace to a place where craft businesses can grow. Mark Henderson has spent a lifetime marketing into the luxury sector and has a passion for British craft. He is chairman of Gieves & Hawkes and founder of The New Craftsmen. Mark is a director of the luxury trade body Walpole, a patron of the HCA and has acted as a mentor on the Crafted programme. He shared his top tips for marketing craft. Horatia Harrod is Commissioning Editor at Sunday Telegraph. She reviews a wide range of media and being daughter of Tanya Harrod has a great understanding of craft. She helped us find the best ways to get our stories into the press for free. Alistair Hugues created Savoir beds together with Stephen Winston, buying The Bedworks from The Savoy hotel in 1997 and creating Savoir Beds. Deciding what price to put on our work and achieving a price that allows us to make a good living is perhaps one of the hardest things for craftspeople to do. Alistair’s talk on pricing was simply the best..
Robin Wood turns bowls and plates on a simple foot powered lathe and has sold most of his work over the web for 15 years. This was not a techie talk it was about the simple things you can do to achieve more sales over the web with less effort. 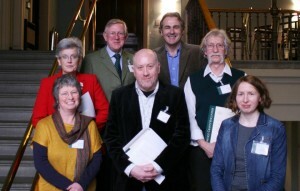 Robin is the chair of the Heritage Crafts Association. The event was held at Carpenters’ Hall in the City of London – a great venue with fantastic craft all around. This event was only possible thanks to a grant from the Radcliffe Trust.